Eritrean officials visit Ethiopia for first time in 20 years – Royal Times of Nigeria. 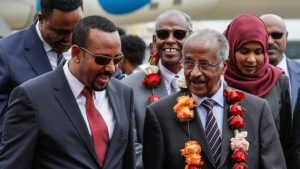 high-level Eritrean delegation led by foreign minister Osman Saleh has arrived in the Ethiopian capital, Addis Ababa for talks on ending the decades-long conflict between the two countries. The delegation, which was received by Ethiopian Prime Minister Abiy Ahmed today, also included Eritrean President Isaias Afwerki’s right-hand man Yemane Gebreab. 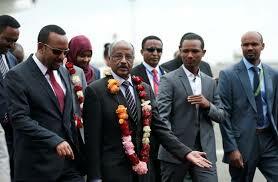 It is the first time in more than two decades that a top-level delegation from Asmara visits Ethiopia. The visit comes a week after President Afwerki said the East African country would dispatch a delegation to Addis Ababa to “gauge current development” in the region. Earlier this month, Ethiopia’s Prime Minister, Ahmed said Addis Ababa would fully accept and implement the terms of a peace agreement between the countries.The UN-backed agreement, which was signed in 2000, awarded disputed territories, including the town of Badme, to Asmara. The two countries fought a bloody border war in 1998 that left more than 80,000 people dead and displaced hundreds of thousands.Eritrea, which comprised of Ethiopia’s only access to the sea, broke off from its larger neighbour in 1993 leaving Addis Ababa landlocked. An Addis Abab-based analyst, AbebeAynete, said the visit could mark the end of the political deadlock between the East African countries.